A new report from the Washington Post found that emergency rooms have seen a spike in incidents involving electric scooters. One particular hospital in Salt Lake City reported a 161 percent increase in scooter injuries—from eight injuries over a four-month time span in 2017 to 21 in that same time period this year. 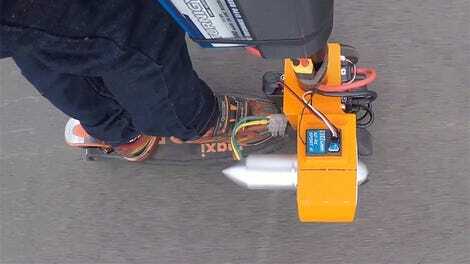 Aside from the reported injuries at the emergency room in Salt Lake City, emergency physicians in seven other cities told the Washington Post they were getting more patients who had been involved in electric scooter accidents, citing “severe” injuries like head traumas “that were sustained from scooters malfunctioning or flipping over on uneven surfaces as well as riders being hit by cars or colliding with pedestrians,” the Post reported. For the uninitiated, a number of dockless electric scooter companies have landed millions of dollars in venture capital to provide passersby the option to grab one and go. The scooters can be paid for by the minute and are powered by an app. But while early adopters might have exalted these scooters, others have been quick to point out that they are “so damn dangerous.” Jalopnik writer Bradley Brownell and a friend tried out Bird—the most popular scooter service, valued at $2 billion. Brownell said his friend’s brakes were faulty. As Torbati noted, these aren’t your run-of-the-mill scooters, and they’re certainly not akin to riding a bike. But it’s as simple as downloading an app and scanning a QR code to grab one and go—it’s no wonder some people are headed to the ER.